Home / Mobility / Be like James Bond with your baby carrier! You may have read about the tweets of Piers Morgan, the British TV show presenter, describing the James Bond actor, Daniel Craig as emasculated while wearing a baby carrier. His comment prompted thousands of responses with many criticising Morgan’s views of manhood. Afterwards, several dads reacted to it by posting pictures of them standing proudly with their babies in a baby carrier. We are making progress and that’s a good thing! Despite what Piers Morgan seems to think about manhood, we are making progress and parents are choosing to share the responsibility of parenting in a more equal way. There is a growing desire of fathers to become more involved in the upbringing of their children, in their education, to build relationships with them and to share the responsibility of parenting as much as possible with the mother. The mother has carried the baby for nine months and often has an easier and natural way of bonding with her child through breastfeeding. The partner might feel left outside and has to put in more work, in the beginning, to create a strong bond with the new family member. A baby carrier is a great way for the partner to take part in parenting and create a bond with the newborn. The baby can feel the closeness and hear the parents heartbeat, that will strengthen the bond between the parent and the child. Pregnancy and childbirth are unique experiences, but they generate many new emotions and life changes. During the first days, the mother has to adapt to her new role and recover from giving birth. A large number of women experience emotional ups and downs soon after giving birth, sometimes called baby blues and in worse cases, postpartum depression. In that case, the role of the partner becomes vital. The partner can provide the baby with the closeness and skin to skin bonding, that is especially important in the beginning and often provided through breastfeeding. That can partly be done by carrying the baby in a baby carrier to create and maintain a bond with the child. When you have adjusted to the new life as a family and realised that now that you are a parent, you have to think of someone else’s needs before your own. But that doesn’t mean that you can’t continue living your own life and doing the things you love. 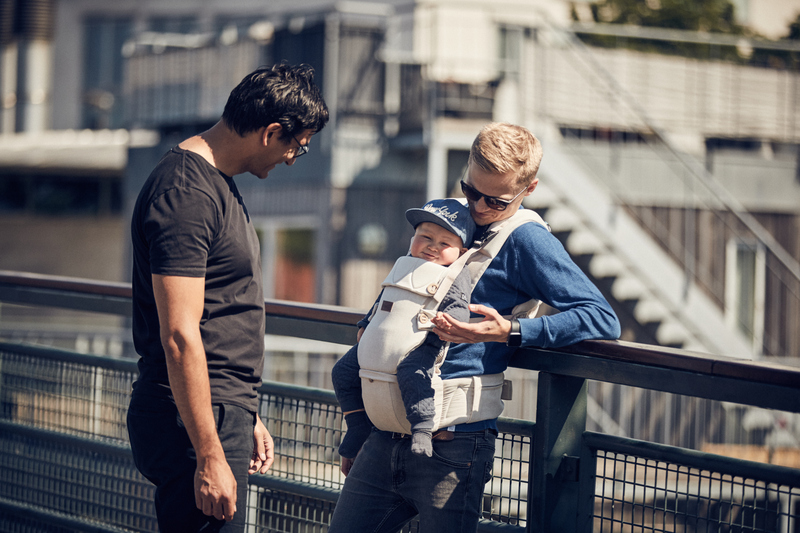 When you carry your baby in a baby carrier, you can easily get around, meet friends at a café or go and watch a football match with your friends. It has so many benefits: keeping in touch with your friends after becoming a parent, sharing your world with your child, and giving the mother or your partner some time to rest or do something for herself. There are many reasons for parents of both genders to use baby carriers. Just like mom-shaming we also have dad-shaming. It’s time to stop judging mothers and fathers for their parenting choices and to start encouraging and empowering each other. Fathers should have the same opportunity to bond and be close with their child as the mother, without people turning their heads. Previous post: Designing Baby Carriers that fit both parents!